A Tight Labor Market May Require Extreme Measures. In West Texas, truck drivers are earning six figures and 20-something-year-old newcomers are doubling their earnings in the oilfields after just two weeks at a junior college. In Red Deer, Alberta, an increasing number of companies are covering the costs of post-secondary tuition or skills upgrading of their employees. Many companies are expanding parental benefits to include egg freezing. A sandwich shop in greater Indianapolis is offering part-time workers college tuition reimbursement. In Windsor, Ontario, companies are offering more flexibility than ever before, including the ability to work from home. A business owner in Redwing, Minnesota, rented homes to the company’s seasonal workers to alleviate housing issues. Anecdotes like these sound extreme, but they are increasingly common-and for good reason. Pressure is building on companies to do whatever it takes to retain workers. In the spring of 2018, the number of job openings in America exceeded the number of unemployed persons for the first time since December 2000, when the Bureau of Labor Statistics began reporting total non-farm job openings. Earlier this month, Statistics Canada reported that job vacancies are up 20 percent in the first quarter of 2018 compared the same period last year. In such a tight labor market, businesses must spend significantly more energy on retention to show employees they are appreciated and valued, because recruiting new employees is more difficult than ever. Colleen Gaudette, an Express franchise owner in Windsor, Ontario, sees the same trend of increased wages. She also reports that companies are using sign-on and completion bonuses for both recruitment and retention. Large corporations are enhancing their paid family leave policies, offering expanded leave and new benefits to more workers, including elder care-and even pet care. As Sodergren observes, at smaller companies, this may not take the form of formal benefits, but rather “flexibility” and patience as workers grapple with day care, elder care, and transportation issues. Sodergren’s office also worked with the client who opened up rental homes to seasonal workers. Businesses have long invested in education and training to help their employees earn credentials and skills that will empower them to do their jobs better. Now, companies are increasingly offering workers education benefits that will help them secure different jobs in the future hoping that it will help them retain these workers at least for the short- and medium-term. 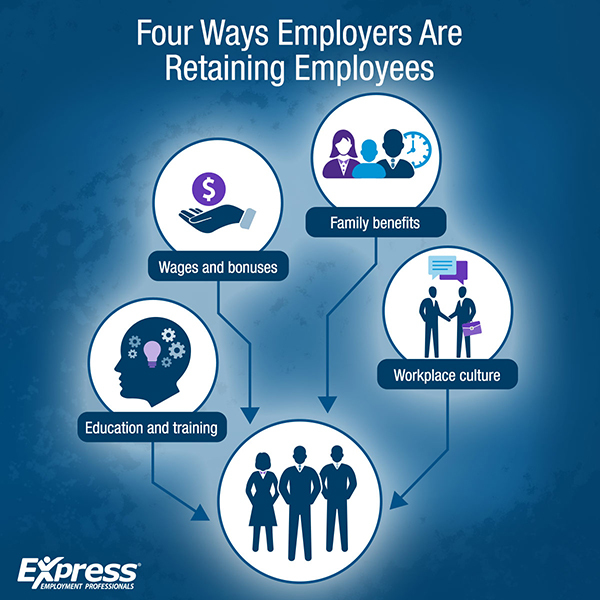 As valuable as raises bonuses, benefits, and education can be, the most important step a business can take to retain employees is to improve the workplace culture. Saying “thank you” is both the simplest and most powerful action an employer can take. Gaudette notes that a company with a positive workplace culture will respond to employees’ preferences, rather than assuming certain benefits will be appealing. “We are seeing a positive trend in companies asking their employees what matters most to them. Getting creative with ways to engage your employees pays dividends. Even a small effort pays off in terms of increased performance,” she said. A focus on workplace culture has spurred an increase in employee appreciation days, family outings and events, special meals and other initiatives to build relationships among coworkers. It also has led supervisors to show a greater tolerance for employees’ shortcomings-tardiness, for example. Awesome post. One of the best ways to retain their employees is by optimizing their office culture. You should also encourage your employees to express themselves and develop a more relaxed environment.